Christmas and New Year for me usually means some new ascents in a mountainous region of Africa or Latin America. 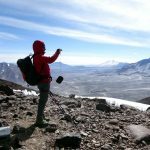 When I received an email from Jagged Globe sometime last year announcing a new trip to Ojos del Salado in Chile’s Puna de Atacama region, I didn’t have any doubts that was the peak I wanted to climb. 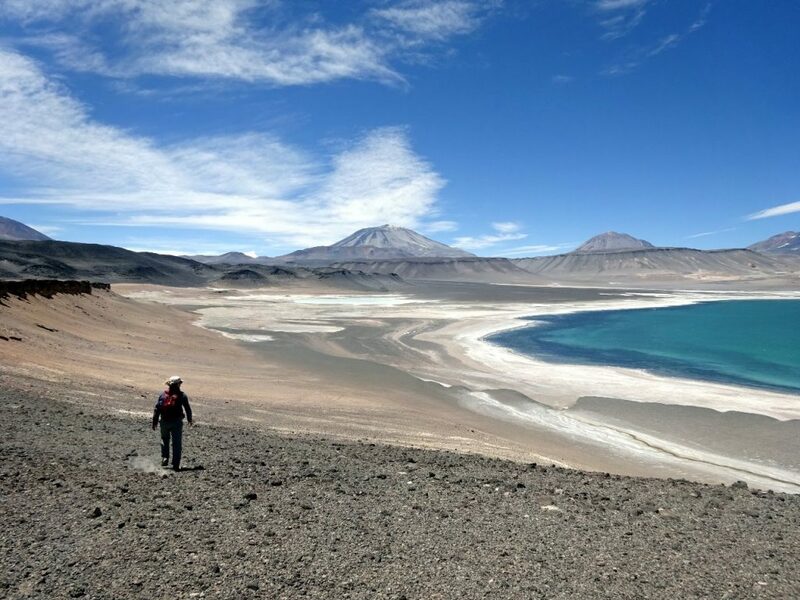 At 6,893m, Ojos del Salado is the highest mountain in Chile, the second -highest mountain in South America, and the highest volcano in the world. 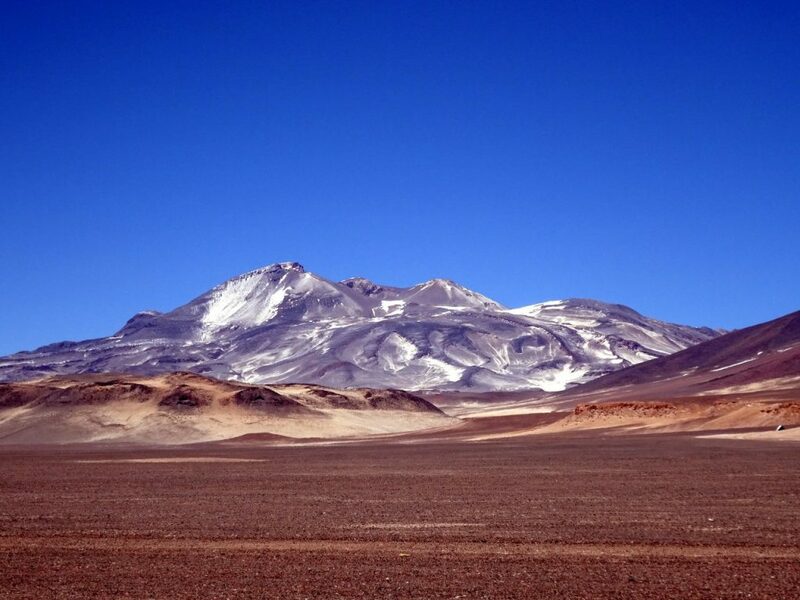 Like its more famous Argentine counterpart Aconcagua (6,959m), the highest mountain in South America, it rises highest among giants in a dry, desert region. But as a climbing objective, it’s a very different proposition. 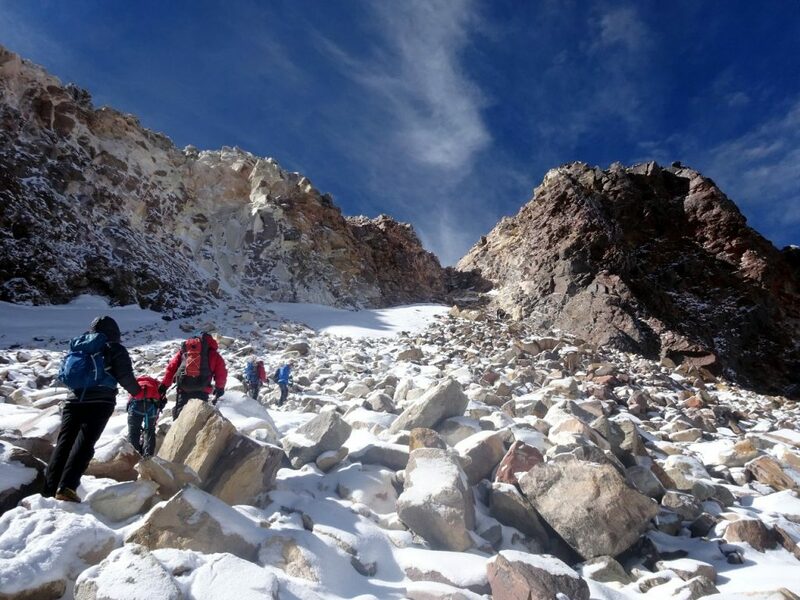 Both mountains are non-technical, but an ascent of Aconcagua is far more strenuous. 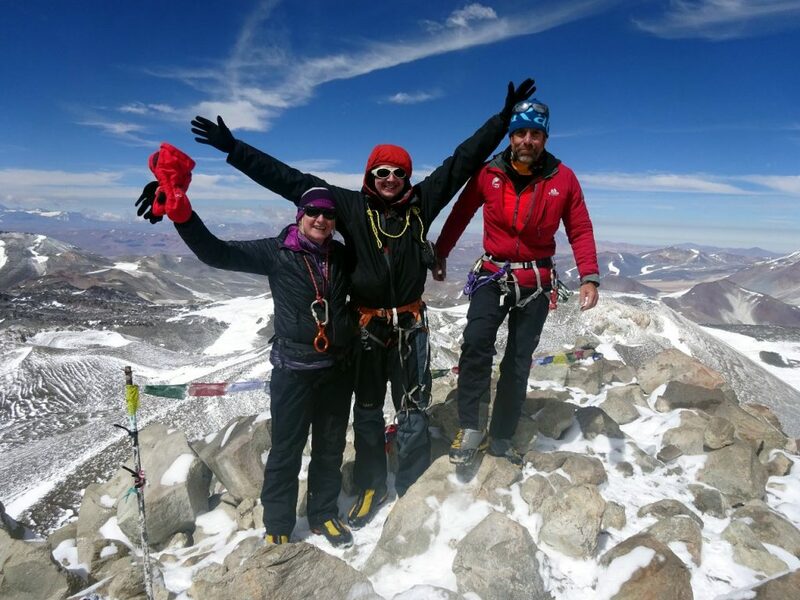 Aconcagua is hemmed in on all sides by smaller mountains and ridges. It’s necessary to trek along deep valleys, cross crashing rivers, and carry 25kg or more as you move from camp to camp up the mountain. 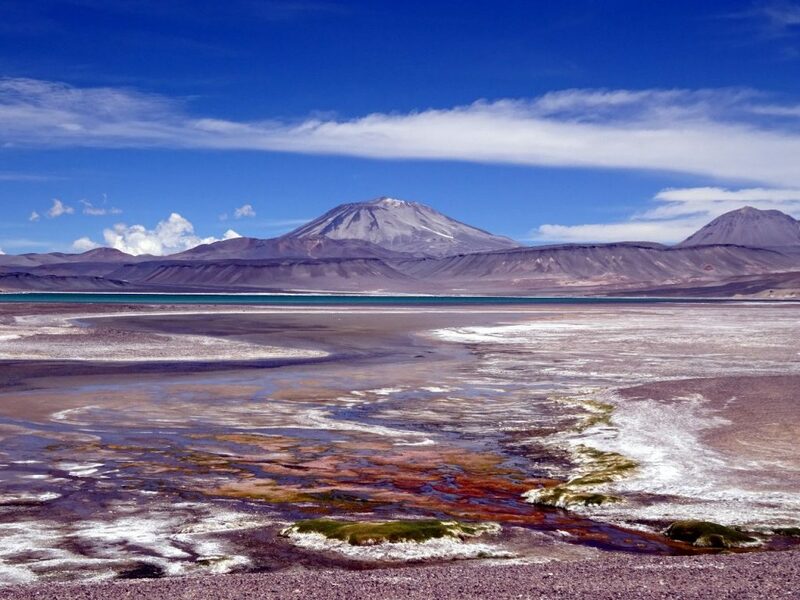 By contrast, Ojos del Salado rises out of a gentler landscape that is more easily accessed by vehicle. Once sufficiently acclimatised, I had been told that we could drive to 5,200m, climb a short distance to a high camp at 5,800m, then climb to the summit the following day. 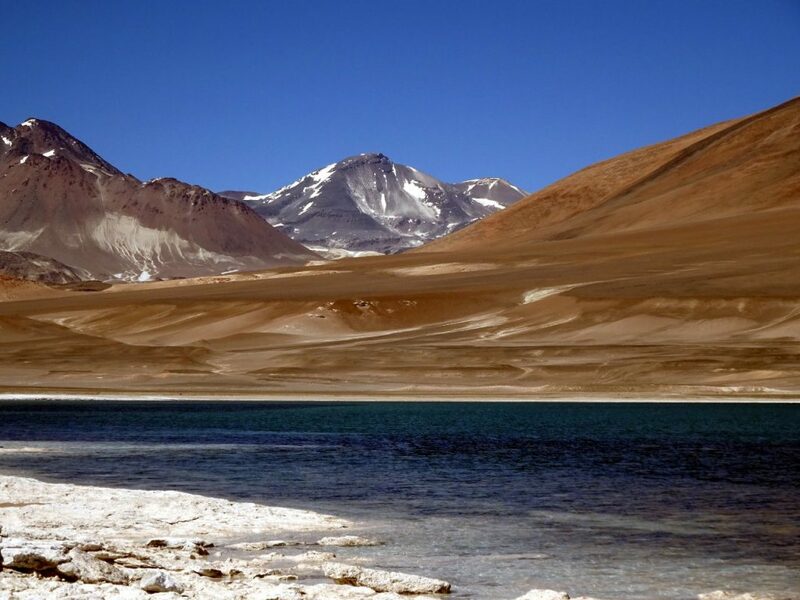 The Atacama Desert in northern Chile is famously the driest desert in the world (some pedants will tell you that technically there are places in Antarctica that receive less precipitation, but obviously those places have quite a lot of frozen water available). The desert covers the whole northern part of Chile, from Pacific coast to Andes mountains. The Puna de Atacama region is the highest part, spanning the border into Argentina. The plateau is over 4,000m in places, and contains a number of isolated peaks over 6,000m in altitude, of which Ojos del Salado is the highest. Flying into Copiapo, a town at the southern end of the desert, 700km from Chile’s capital Santiago, was something of a surreal experience. There was blue sky all around as the bright sun shone over the vast plain of white cloud beneath us, like a calm sea rippling in a light breeze. The higher peaks of the Andes rose above this sea like mountainous islands. It felt like something out of a C.S. Lewis fantasy tale as our aircraft dropped into the water, out the other side and into another world. This wasn’t the frozen land of Narnia encased in snow, but a dull, rolling desert world rendered gloomy by a thick band of low cloud. The rest of the morning was somewhat chaotic as a ragtag band of characters from the local agency Paula Expediciones came to meet us, drive us to Copiapo and deposit us there to wander around bars while they went off to pack our expedition supplies. They returned a few hours later with two red Toyota Hilux pickup trucks piled high with our expedition supplies. There were four of them and six of us (five clients and Jagged Globe leader Chris Groves). All ten of us crammed into the seats with our rucksacks on our knees. This was to be our mode of transport for much of the next two weeks as we sped off into the desert. We drove for three hours that afternoon along a valley almost bereft of life, featureless as a snail’s shoe cupboard – just rocks, sand and gently sloping hills on either side. We hardly saw another vehicle. The long, straight road rose imperceptibly, and only our altimeters told us that we had climbed thousands of metres. We camped that night above a dry riverbed beside the road. On the opposite side of the road was the first greenery we had seen since leaving Copiapo, a small oasis of lush grass and scrubby trees, providing an incongruous smudge of greenery beneath the drab hillsides. I had been wondering about our crew. They were a cheerful bunch, but they had seemed a little disorganised. One was a photographer, another an artist, and a third said he was along as the interpreter. Only their leader, Paula, was a professional guide. Now they excelled themselves, however, erecting a giant dome tent and populating it with comfortable tables and chairs. The tent was big enough, not only for ourselves, but the various stoves and kitchen facilities. A tasty dinner of spaghetti bolognese was produced for us and served with the best Chilean Merlot. We went to bed happy. The following day we continued up an increasingly narrow valley which eventually led up and over a 4,000m pass. Below us was a vast plain with a salt lake, half white and half azure. Beyond it, three triangular grey peaks rose up like heraldic chevrons. They were streaked with narrow lines of snow, but otherwise they did not look at all dominant. I was surprised to learn they were Cerro Tres Cruces, the highest of which at 6,748m is the fifth-highest mountain in South America. The lake was Laguna Santa Rosa, and we spent a peaceful two nights in a basic hostel on its shore. We were to travel hundreds of kilometres over those two weeks on well-maintained roads, but this hostel was one of only two inhabited buildings we came across in that time. It was very basic, without running water, but it was the most civilised of the pair. The lack of tourist infrastructure seemed extraordinary to me, given the region’s great potential, but perhaps the lack of water is the explanation. All drinking water has to be carried in by vehicle, and the dryness and the altitude mean that you have to drink a lot of it. Laguna Santa Rosa’s highlight is its flamingos. The little water that falls here cannot drain away. 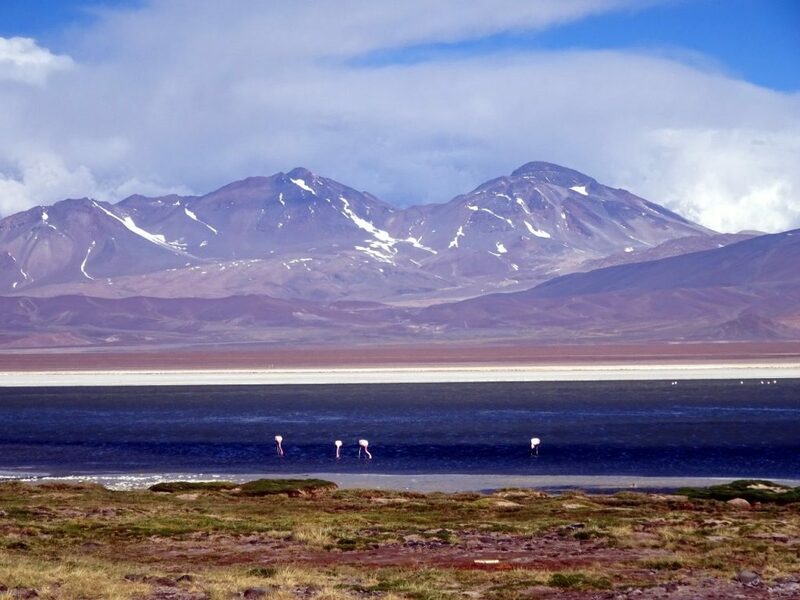 Instead, it evaporates, leaving behind all the minerals that arrived with it, and this is the reason for the many salt lakes on this high plateau. The flamingos are a consequence. They stand just off the shoreline, dipping their bills in the water, occasionally skimming its surface in pairs. When they fly, their long necks and legs give them a tube-like appearance. The tubes are striped pink, white and black like a gay-pride pennant flitting above the water. We spent many a peaceful moment sitting by the waterside, watching the flamingos as we looked across to the Tres Cruces. It was a windy place, and the water’s edge smelled of salt and sulphur, but those aren’t the abiding memories. The following day we climbed a hill behind the hostel called Maricunga. 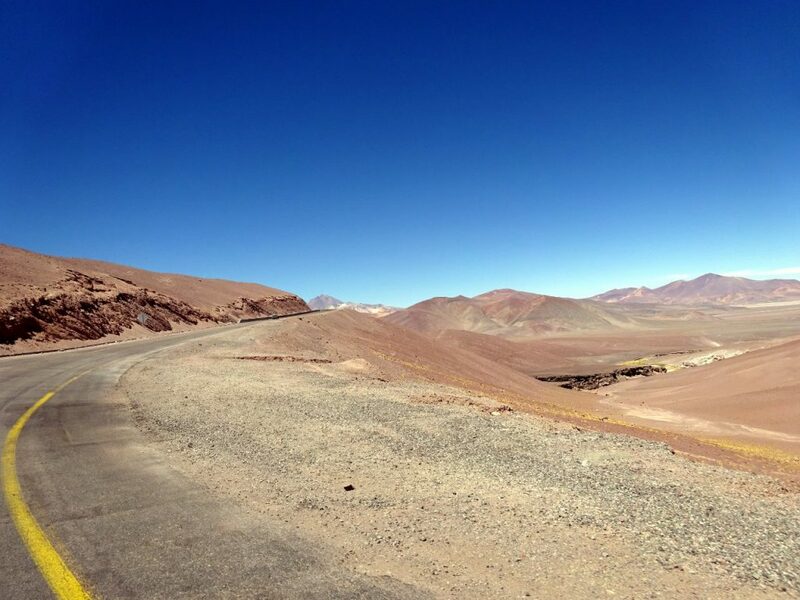 The featureless landscape of the Puna de Atacama is deceptively big. This hill looked like an innocuous bump on the skyline just a short distance away, but the ascent ended up taking us nearly 7 hours. As we rose above the lake we could see that the turquoise waters where the flamingos grazed represented only a small portion of its surface. There was a far greater area of gleaming white salt. Edita shot ahead, and I had to ask Chris to catch up with her and tell her to slow down. Luckily, although she’s quick, she’s not as quick as Chris. Maricunga had a nice broad ridge leading to the summit. The peak we climbed wasn’t the highest point, just the southernmost summit of several, with a little basin the other side surrounded by some of the other summits. Through a gap we saw a broad expanse of white like an ice sheet on the plains below. We knew it wasn’t ice though, but salt. The following day we drove 100km across the desert to Laguna Verde near the Argentine border. It was a drive of two halves. The first half crossed a flat expanse of desert sand. Although there was nominally a road, it was a road in the same way that a beach is a road. Our drivers could have pointed their vehicles in any direction and the terrain was the same. Then we hit a proper tarmacked road, as smooth as a billiard ball, and whizzed on east. We drove up a shallow valley choked with grass and were surprised to see a substantial waterfall at the top end. It was the first fresh water we had seen. How it arrived at the place before abruptly vanishing into the lush scar in the desert was anyone’s guess. If this river was a last remainder of the winter snows then I would have expected it to have run out of water by now. There were no glaciers on the dry mountains surrounding it. The road passed beneath Cerro Tres Cruces, three peaks of rolling black ash that looked like an easy walk up, the sort of peaks you can run up and down in an afternoon. But we were at 4,100m now, which meant the summits towered more than 2½ vertical kilometres above us. I was constantly deceived by the scale of this landscape. We were keeping our eyes out for Ojos del Salado. Was it this peak over here or that one over there? I finally discovered a crude method of estimating the height of the surrounding mountains – by looking at their colour. The desert plains were a pale brown. The colours darkened on the foothills of the surrounding mountains. Smaller mountains were a darker chocolate, while bigger peaks such as Cerro Tres Cruces were almost black. 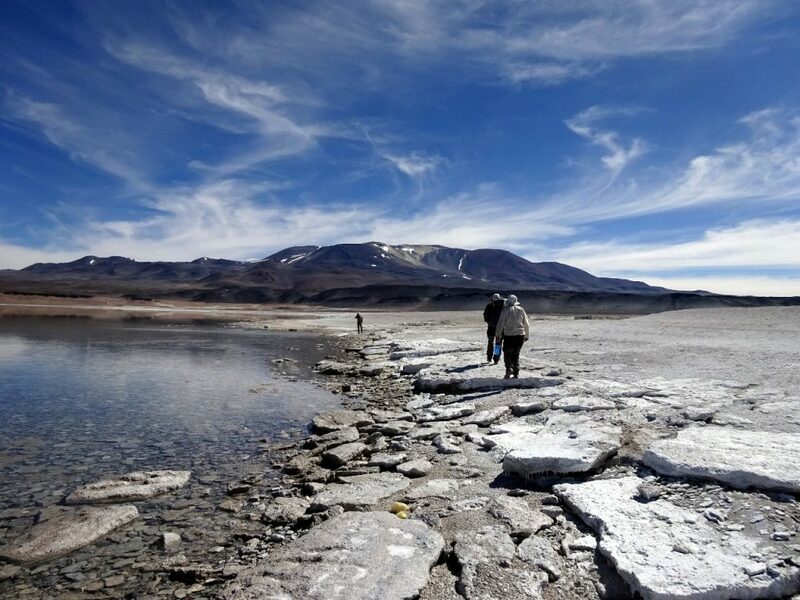 When Ojos del Salado emerged at the end of a southern valley, it was unmistakeable. The valley floor was a dark chestnut colour. Ojos rose in a towering mass at the far end, a crumple of peaks wide enough to swallow the skyline. Its lower slopes were black with only a light dusting of snow, while its upper reaches were as grey as ash, providing a silver sheen to the horizon. We spent two nights camped on the shores of Laguna Verde, a salt lake surrounded by rolling peaks. We were at an altitude of 4,300m and this was the highest part of the plateau. We completed a 21km walk around the perimeter of the lake. This was a walk of great variety, the first part along the smooth metalled road that swept incongruously through the landscape. Not a single car passed as we walked under broad skies. There was a crispness to the air and a light breeze, but the sun shone brightly above wispy clouds, streaking the the sky like paint splashes from an artist’s brush. I could count a dozen isolated mountains rising up around the lake, each of different character. At the far eastern corner we caught another glimpse of Ojos del Salado. Chris pulled out his map and we studied the route through binoculars. The trail appeared to zigzag up a giant scree slope on the steepest face. We couldn’t tell if it traversed across a small glacier or skirted around it, but it eventually reached a shoulder which led up to the jumble of crags which crowned the summit. Ojos del Salado is predominantly non-technical, but we did know that there was a short rock climb onto the summit. We would have to wait and see how significant a climb this would prove to be. The eastern shore of Laguna Verde was a surface like nothing I have walked on before. Great slabs of salt caked the waterside. At one place we came across the mummified carcass of a vicuña which I’m guessing must have starved to death quenching its thirst in this barren landscape. The northern shore of the lake appeared to be guarded by cliffs. Ahead of the others, Edita and I found a way up to their crest only to look down the other side and see a landscape too convoluted to find an easy route onwards. Meanwhile Chris led the rest of the group beneath the cliffs on a narrow strip of beach. We returned to follow them. Later I tried to take a shortcut across a spit of sand and found myself sinking to my shins in sulphurous quicksand. Edita helped me to wash the bottom half of my trouser legs in the waters of the lake, but the salt quantity was so intense that when my trousers dried they were the texture of cardboard. My trousers weren’t the only item of clothing to suffer by the shores of Laguna Verde. Close to our campsite on the sands were a series of hot springs. When Edita went to bathe in one of them the following day, I sat on the side reading my book while I dangled my sandalled feet in its volcanic waters. Soon afterwards the soles of my sandals started splitting from the rest of the shoe, and I had to throw them away at the end of the trip. We had intended to climb Cerro Mulas Muertes (5,897m) the following day, a long ridge of a peak directly above our lakeside campsite. But by the time we packed up personal kit, sleeping tents, kitchen tent and completed the jigsaw puzzle of loading everything into the back of the two pick-ups, roped it all up safely, driven to the next place and assembled everything all over again, it was taking us around six hours to move camps. You don’t have this problem on a trek, because people can leave in relays when they are ready. Instead we were so limited for space that everyone had to wait for everyone else before any of us could leave. At times it felt like we were the Joad family leaving the Oklahoma dust bowl, bound for California in a single Hudson sedan. Fortunately our prospects weren’t quite as bleak as the Joads, but there was one thing against us. The plan was to climb Cerro Mulas Muertes, drive south and climb Cerro Vicuñas (6,067m) the next day. But if it took us six hours to move camps then this plan wasn’t likely to have a successful outcome, any more than handing Prince Philip a set of car keys. 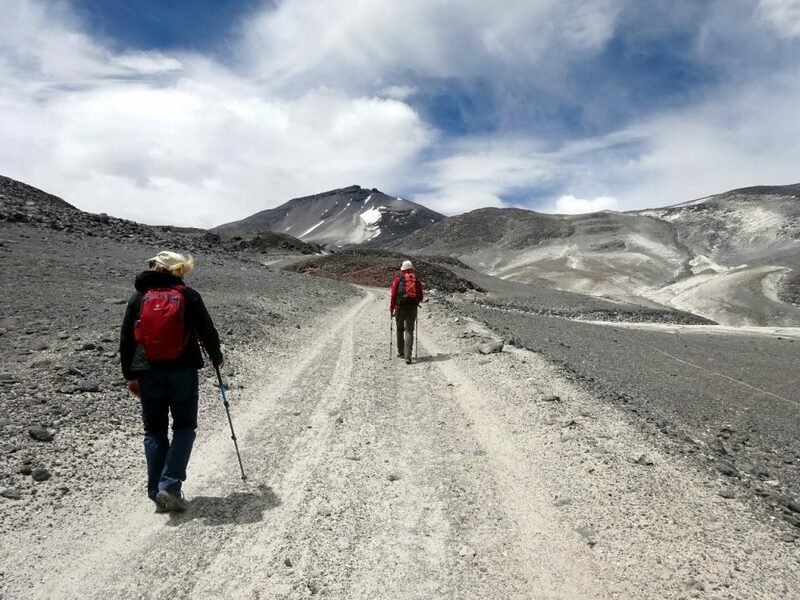 We realised that we didn’t have time to climb Cerro Mulas Muertes if we were to keep to our itinerary, so we opted to move camp and climb Cerro Vicuñas, for no better reason than it exceeded the magic 6,000m. I covered our ascent of this peak in my previous post, Cerro Vicuñas, the world’s easiest 6,000m peak, so I won’t repeat it again here. 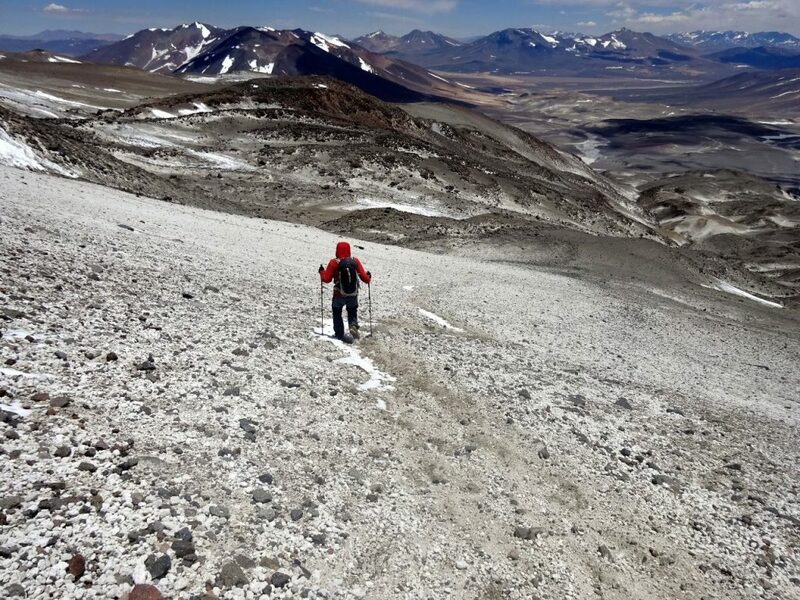 With the ascent of Cerro Vicuñas behind us and several nights sleeping above 4,000m, we were considered well enough acclimatised to make our attempt on Ojos del Salado. 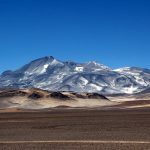 Our journey from Vicuñas to Atacama Camp, base camp for Ojos, was undoubtedly the most hair-raising part of the whole trip. I don’t have much hair on my head, but short as it is, it was most assuredly raised to its maximum as we sped across the sand. We were soon to discover that our driver had little experience driving across this sort of terrain in a 4WD vehicle. A short distance out of camp, he diverted from the track and became stuck in the sand. With each squeeze of the accelerator, we heard the wheels spinning, saw smoke rising, and felt ourselves nestling further into the sand. The crew in the other vehicle turned around and came back to help. We got out and watched as they lay on their bellies, scraping out a channel in the sand. Then we all helped to push the vehicle out again. Back on our way, our driver decided to take a different approach. The terrain rippled like a ploughed field, and he hurtled over every bump like Evel Knievel trying to leap double-decker buses. Our vehicle left the ground and we lifted slightly off our seats. A short distance later we saw them gesticulating furiously from the vehicle in front. Edita pointed at the wing mirror, and we could see behind us the green netting over our luggage tilting precariously like the Leaning Tower of Pisa. We got out, unpacked and repacked. I was feeling increasingly nervous. We had no seatbelts in the back, and I was convinced our vehicle was going to turn on its side. I spent the remainder of the journey with my arms in front of me, ready to drop into the brace position. Nobody was more surprised and relieved to reach base camp safely than our driver. He was shaking visibly and I patted him on the shoulder. Paula came over and gave him a big hug. Poor chap. He slept for the rest of the day, and the following morning he had to be evacuated with altitude sickness. I guess he was worried about driving us back again. I felt sorry for him; he was an amiable character, but I don’t think this had been his sort of trip. 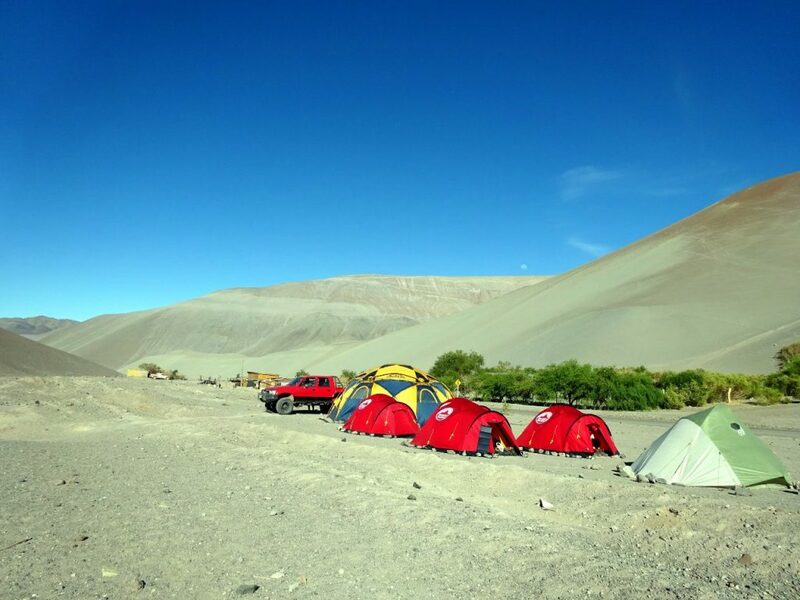 On the plus side, Atacama Camp was a fabulous setting on a high sandy ledge. To the north were the wide open spaces we had crossed on our white-knuckle ride. From the back porch of our tent we looked across a broad plain to Cerro Vicuñas, and directly above us folds of grey led up Ojos del Salado. The dark-grey scree slope that led up to the summit walls still looked distant. The camp was spacious. There were three or four other groups sharing it with us, and it was as comfortable a setting as any big mountain base camp I’ve stayed in. On the negative side, even in this remote location which takes resources to reach, there were douchebags. We had precious poo bags and toilet paper stolen from our toilet tent. This was annoying (nobody wants to reuse a poo bag because some swine has nicked all your clean ones), but we learned later that an intrepid Italian team who had cycled to base camp from the Pacific coast had a more serious problem. 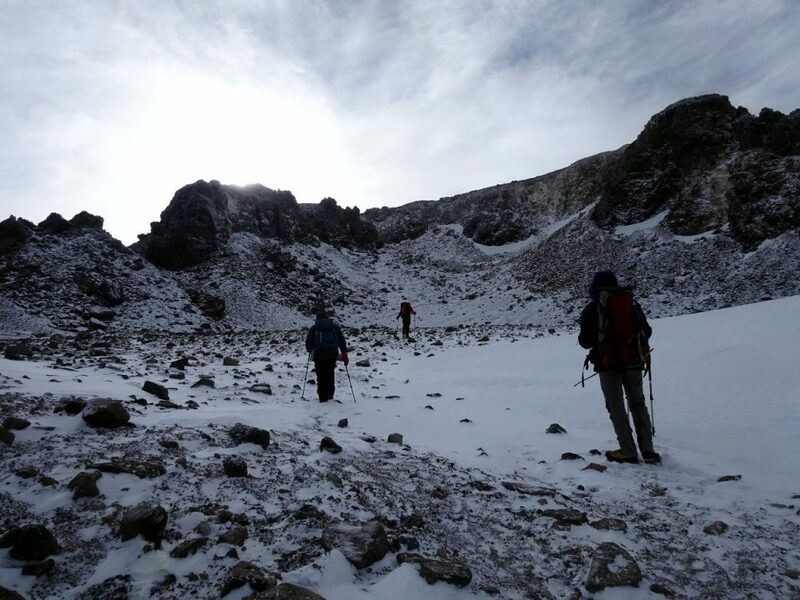 They carried mountaineering equipment up to Tejos Camp (5,800m), only to return a few days later to find it had been stolen. It seems that base camps the world over are the domain of freeloaders. 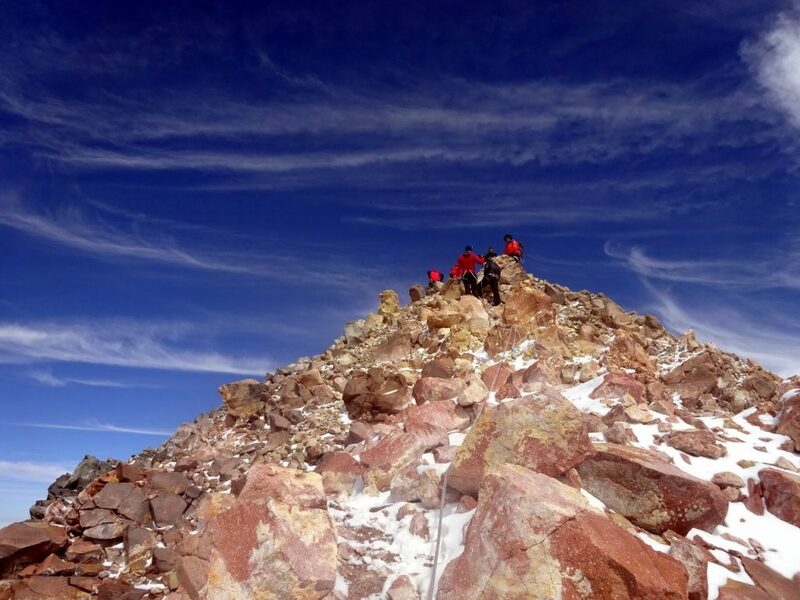 We had intended to do a load carry up to Tejos, return the following day to camp, then attempt the summit from there. But word was reaching us that there was so little snow that it was even possible to drive up to Tejos. 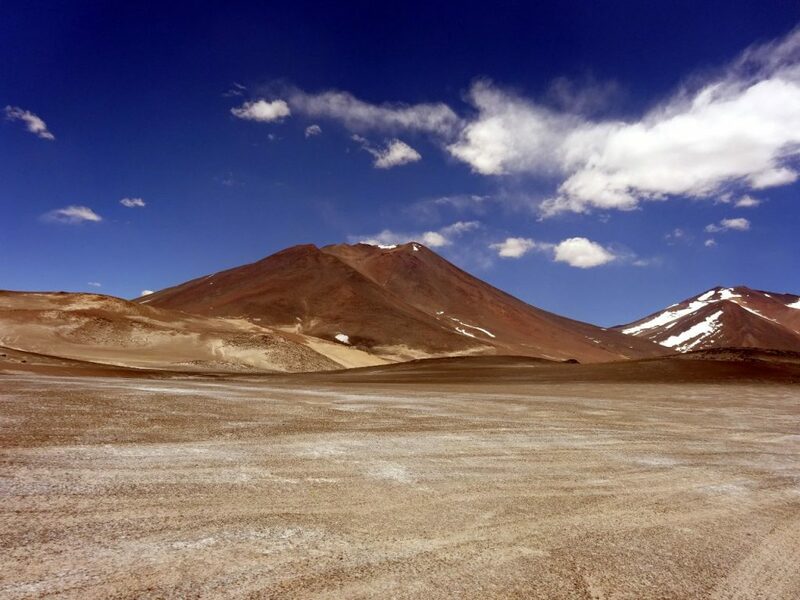 The gentle landscape around Ojos means that its a popular venue for altitude vehicle records. 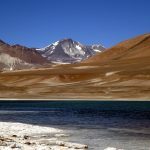 5,800m might sound like an unlikely location to find a vehicle, but in fact the world altitude vehicle record was set on Ojos del Salado in 2007, when two Chilean drivers took a Suzuki Samurai jeep to the staggering height of 6,688m. Paula was convinced we wouldn’t need to carry all our stuff up to Tejos, so the following day we just took light packs for an acclimatisation hike. We walked along the road, and the gentle gradient meant that it was an easy stroll. It took Edita and I just 2½ hours to reach the bright red freight container that was used as a refuge at Tejos camp, and less than an hour to come down again. 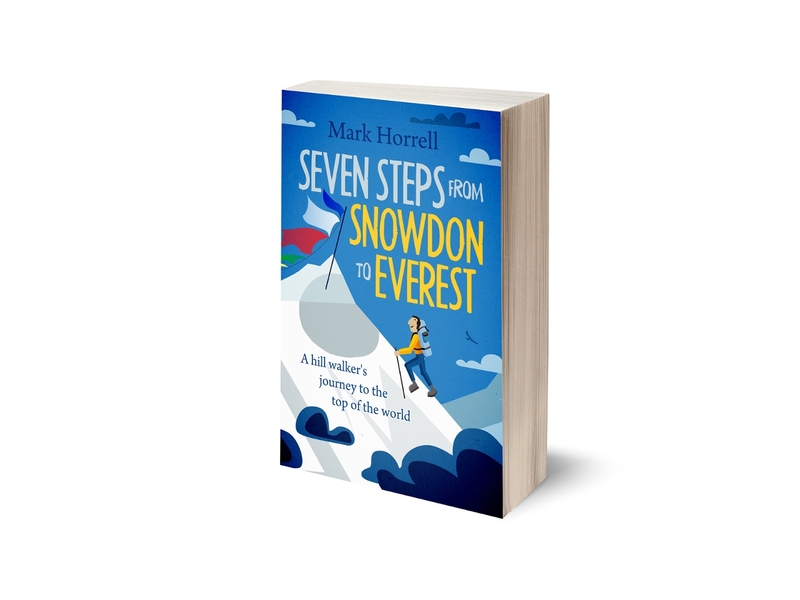 With just a steep scree slope above, it seemed that the ascent would be straightforward. Back at base camp, the news got better still. Chris described a new plan to us. Instead of moving camp up to a bleak Tejos and staying a night up there, we could stay at base camp, then drive up to Tejos in the middle of night and start our climb from there. ‘We’ve walked up to Tejos already, so it isn’t cheating,’ he said. Some people might debate this, but frankly, if driving most of the way up a mountain is cheating then we’d cheated already by driving to base camp. We might as well go the whole hog and drive to Tejos too. There were no objections to Chris’s proposal. In fact, it was greeted with great enthusiasm. Paula had arranged for a new driver to come from Copiapo. This was Danilo, who drove trucks in the mines of the Atacama. Not only was he accustomed to driving on this terrain, but he worked for much of the time at high altitude, so there was no danger of him getting altitude sickness here at 5,200m. Soon after his arrival, Chris and the crew did a test run. It took them only 15 minutes to drive up to Tejos, and a little longer to come back down again. Danilo had driven carefully, looking after the vehicle and nursing it up the slopes. As the sky lightened, it became increasingly cold, but I was better dressed than I had been on Cerro Vicuñas. We left for our summit climb in two shifts. The slower party, led by Paula, left at 2am. Edita and I crawled out of bed as we heard the vehicle revving up. We joined Chris in the dining tent, and had a surprisingly good breakfast of tomatoes and guacamole on toast while we waited for Danilo to return from the first relay. He was gone longer than we expected, but we hadn’t yet started to worry when we heard the sounds of an engine on the slopes above. We jumped into the vehicle at 2.38. The first section seemed unfamiliar in the dark. We bumped around for a bit, then Danilo slowed down as we seemed to arrive at some sort of plateau. The rest of the drive seemed gentle. 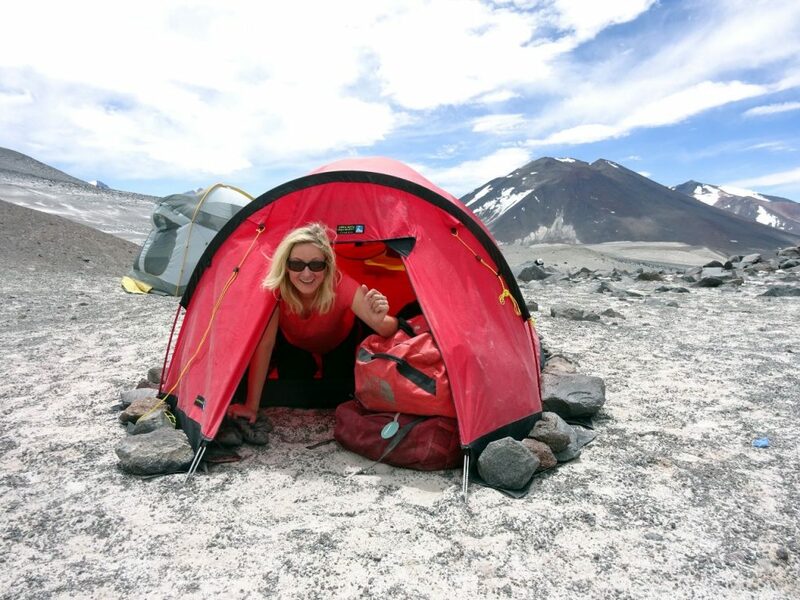 We arrived at Tejos Camp at 2.54, and by 3am we were leaving on our climb. Chris set off quickly up a continuation of the road. He had never climbed the mountain before, but Paula has given him verbal instructions to find his way in the dark. He spotted an arrow pointing off a track to the left, and we started climbing in zigzags. There were head torches of other climbers both ahead and behind, but not so many. 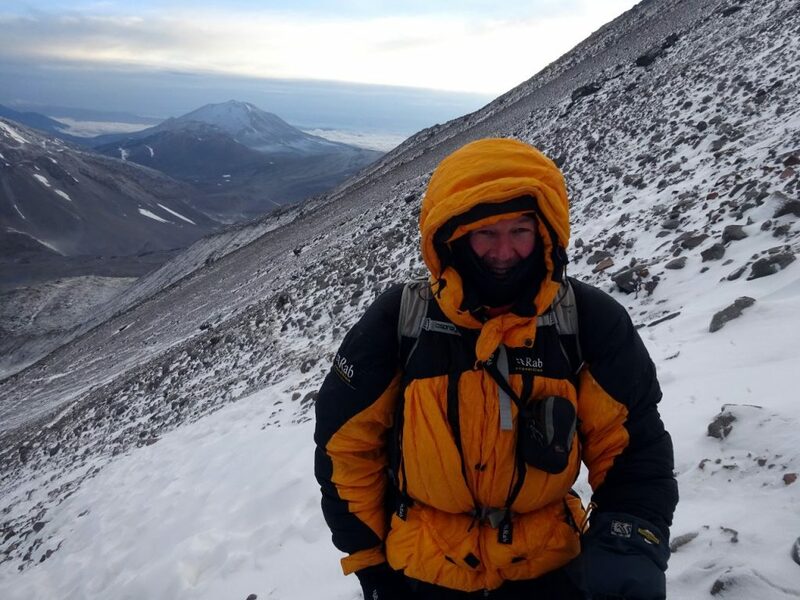 There had been two or three inches of snow overnight, but we made good progress, slowly catching then overtaking the other climbers, including the other members of our group. At 8.30 we stepped onto the crater rim. It was a splendid place. As the sky lightened, it became increasingly cold. I was better dressed than I had been on Cerro Vicuñas. This time I wore proper mountaineering boots, and wore more layers. Even so, I had to wriggle my toes to keep them warm. A bigger problem were my fingers. It soon became cold enough to wear my down mitts, the ones that had comfortably kept my hands warm on 8,000m peaks, but for the first time ever in my experience, my fingers remained cold, and only when Chris stopped for a rest was I able to get them warm again. I wasn’t the only one of us feeling the effects of the cold. Chris continued on zigzags up the slope. At 7.30 we stopped to put on down jackets as the temperature showed no sign of improving. We were now over 6,500m, and Chris confessed to a schoolboy error. Paula was the only one carrying a rope and she was now far below us. 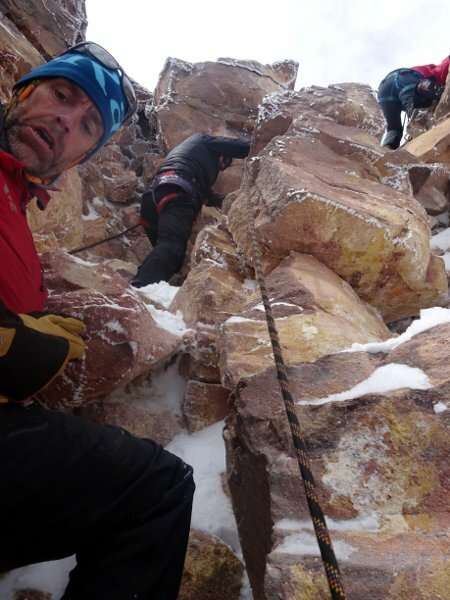 We didn’t know whether we needed the rope to climb the final section to the summit. For a climber, this was a bit like getting out of bed and setting off to work without putting on your underpants. It was so cold that we had no choice but to continue upwards. The zigzags ended and we found ourselves heading straight up a snow gully. At 8.30 we stepped onto the crater rim. It was a splendid place. In front of us was a smooth disk of snow like a saucer of milk. About half of the crater walls remained, forming a solid wall opposite, rising to the highest point in Chile atop a rugged cliff face. I guess that we were now at around 6,700m and had another 200m to climb. We didn’t know how technical the final section was. We knew there was a fixed rope up it, but not how safe it was. We could either wait for Paula with our rope, or we could continue up and see if we could climb it on our own. But it was still bitterly cold. If we waited too long here then the proverbial brass monkey definitely wouldn’t be having any children. Then Chris offered a solution. ‘Let’s get in the shelter,’ he said. I looked around, but couldn’t see anything more homely than rocks. He pulled out a piece of orange nylon, unfolded it, in within seconds the three of us were cowering inside a small rectangular box and peering out of a window in its side. I could see that Chris and Edita were both shivering, but steam was evaporating off us; within minutes we had warmed up, and we prepared ourselves for a long wait. I could hear other climbers crunching past. We probably presented a funny sight for them, like a talking shed, but we didn’t care about that. We had been in the shelter less than half an hour and were warming up nicely when we heard familiar voices outside. We were surprised to see members of our team so close behind, but Paula was bringing up the rearguard and was not among them. 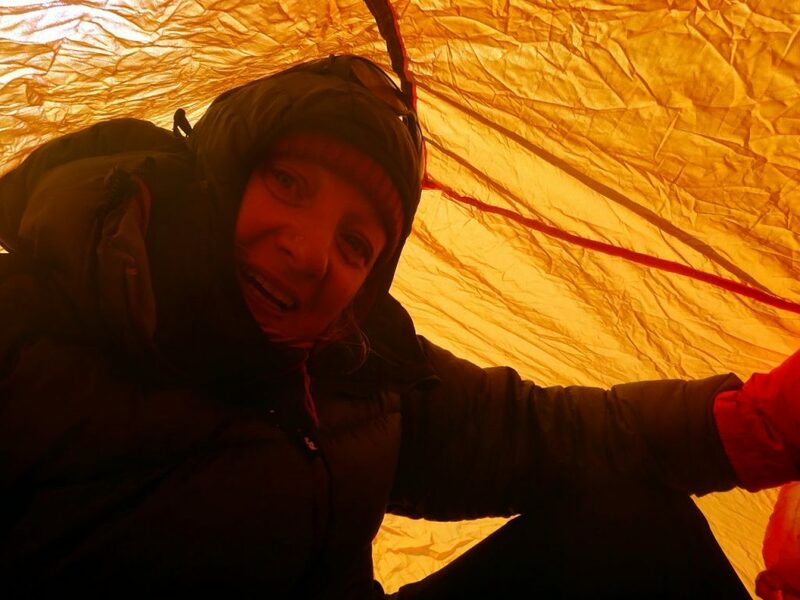 Chris, Edita and I decided to invite them to take over the shelter while we proceeded onwards. It was 9.30 when we set off up the final short section to the summit. It didn’t look very far, but it ended up taking us another hour and a half. The path curled clockwise inside the crater walls, gradually angling up towards a gap in their defences. The going became gradually harder. It was a good trail to begin with, but it soon turned more rocky. Up to our right on the highest part of the crater walls, we could see figures standing on the summit. The trail steepened and became a boulder field. It had taken us only 11 days to come to nearly 7,000m in altitude. We were still not properly acclimatised to those extremes. I could only advance a few steps at a time before stopping to get my breath back. I glanced up at the technical section. It didn’t look too bad, but I knew it was going to be a good deal harder than it would have been at sea level. I glanced up at the technical section. It didn’t look too bad. Chris was much quicker than Edita and I. We struggled on and found him waiting at the bottom of the tricky bit. A fixed rope led up a section of 5m scrambling before the trail turned to the right and out of sight. Chris sent Edita up first. He followed behind her, and I went up last. The vertical section proved to be straightforward, a relatively easy scramble with plenty of hand and footholds. At the top was an anchor. The route diverted to the right up a ridge that was more exposed, but then it continued at a gentler angle. It reminded me of the top of the Inn Pin, when you know the hard section is behind you. There were a couple of large boulders to get over. I grabbed all three of the old fixed ropes and hauled myself up. Above these, it was a 20m ascent up the ridge at a gentler angle. It was no longer climbing, but walking. I looked up and saw Edita standing on the summit, pointing her camera at me. ‘Some words, Mark?’ she said as I arrived to join her. My brain wasn’t really working, and there was only one thing I could say in those circumstances. It was 11am. The view from the summit was amazing – one of the broadest, widest views anywhere. Ojos is quite a sprawling mountain with a few lower summits to the west. 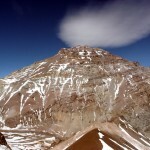 We could see new peaks on the Argentine side, including the Argentine summit of Ojos. That summit was supposed to be more or less the same height as the point we were standing on. Both summits straddle the border, but one is easier to climb from the Argentine side, while the other is easier from the Chilean side. 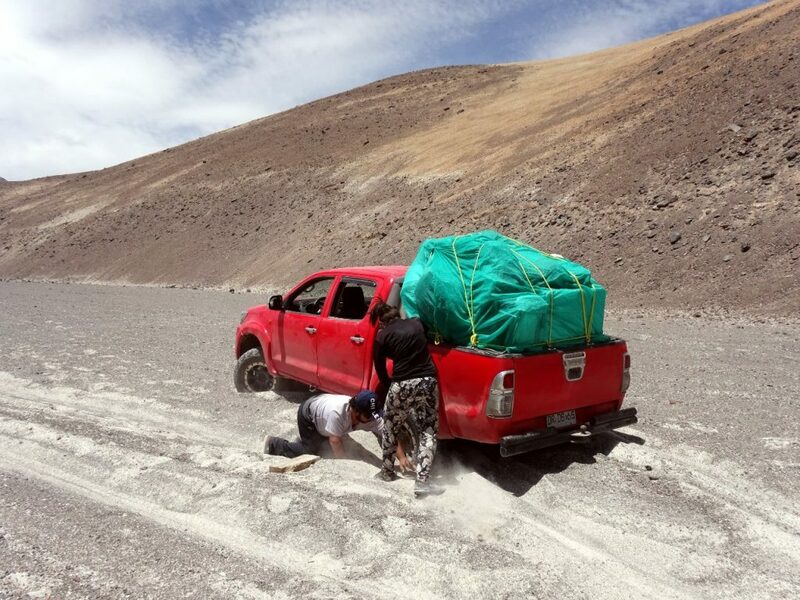 Neither is particularly difficult, but the road network means that more people climb Ojos from Chile (it helps when you can drive up to 5,800m). We spent about thirty minutes on the summit, then headed down. I used the ‘buttock method’ to get down the technical section. This involves sliding down on your cheeks. Chris stayed near the top to help the rest of our group, who were now approaching. Edita and I continued down. Our descent was rapid. I expected the long steep section down zigzags to be painful, but there was a more direct shortcut down an 800m scree slope. Gravity helped us to get down it very quickly. Before we knew it, we were approaching the huts of Tejos. It took us about an hour to plod slowly the rest of the way down the track. I was like the walking dead as I approached base camp. There was no one to welcome us when we hobbled into camp just after 2.30pm. The camp was in exactly the same state as we left it 12 hours earlier. We crashed out in our tent for three hours. The time vanished into dust. At 6pm, with still no sign of the rest of our team, Edita decided that we had to do something to welcome them. She went into the dining tent to tidy up, and I sheepishly followed to obey her instructions. The rest of the team found me washing the dishes when they arrived at 6.30. All but one had reached the summit. They complimented me on my stamina and work ethic, not entirely deserved. It had been a long but satisfying day. 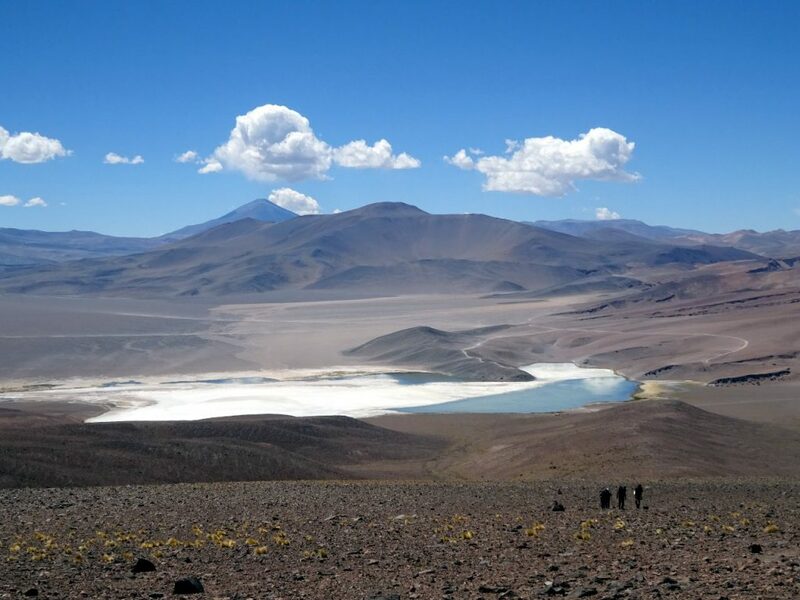 The trip hadn’t always run smoothly, but this was Jagged Globe’s first visit to Ojos del Salado, and I’m sure they will smooth out the rough edges on future trips. To a certain extent, we were pioneering. Things don’t always go perfectly in those situations, but that just adds to the adventure. In the end, it was a successful expedition in a fabulous part of the world. We made new friends, and I can recommend it to anyone. You can see the rest of my photos from the trip on Flickr.